We all know that Trestles is priceless to us personally, but did you know the beach is worth millions and millions and...millions? UCLA researchers have found that surfers attracted to Trestles generate millions of $$$$ for the local economy by spending money at restaurants, shopping, buying gas, rentals and other beach-related items. Researchers estimate surfers visiting Trestles generate from $8 million to $13 million a year for the City of San Clemente. Wow!! The other cool part of the data shows that nearly 83% of the surfers visiting Trestles originate from outside the city of San Clemente...and get this, the whole crunchy, surfer-dude stereotype that most surfers are young and underemployed is now officially debunked. The average Trestles surfer is 35.6 years of age, is well-educated (42% of respondents have a minimum of a college degree), works full time and earns a high wage (41% earn $80,000 or more in individual income). Plus, they really know how to surf! 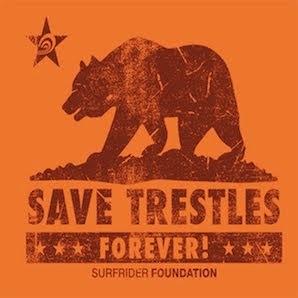 The average Trestles surfer has 19.7 years of surfing experience! So, What's your surf spot worth? PS--we still have not heard when and where the next public hearing will be. We do know that it will be sometime this summer or early fall. Help us start spreading the word now! Last time, over 3,000 people attended the Coastal Commission hearing, and with your help, we can get thousands of people to attend the Secretary of Commerce hearing. Our Federal government needs to see first hand how many people want to protect Trestles and San Onofre State Beach--and your help is key!!! I never thought about the millions it must be worth! Great point. However, there is also a tremendous cost to NOT building the Toll Road. Everyday, hundreds of thousands of working people waste thousands of gallons of gasoline sitting in traffic because the Toll Road has not been built. There is also the lost time that hardworking people could spend with their families. Instead, it is wasted sitting in traffic. All Trestles has done is make the owner of the Carl's Jr very rich.